Peel eggplant. Cut lengthwise into 1/4 inch slices. Press each slice between pape towels to remove moisture. For batter combine egg, milk and 2 t olive oil. Add flour and 1/8 t salt; beat till smooth. Dip eggplant slices into batter, a few at a time. Cook on both sides in a small amount of hot oil till golden brown. Drain on paper towels. Combine romano, ricotta, 2 T parsley and pepper. Place about 1 T of the cheese mixture in center of each eggplant slice, roll up jelly-roll style. Place seam side down in10x6 baking dish. Cover and bake in 375 degree oven about 20 minutes or till heated through. Meanwhile, place undrained tomatoes in blender, blend till smooth. In saucepan cook onion and garlic in 1 T olive oil till onion is tender. Stir in blended tomatoes, tomato paste, 1 T parsley, sugar, oregano and 1/2 t salt. Boil gently uncovered for 6 to 8 min or till mixture is reduced to about 2 cups, stirring occasionally. 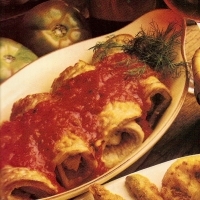 Serve over eggplant rolls. This looks awesome - 5 forks and bookmarked!